Our past commentaries suggested that the federal open market committee (F.O.M.C..) would move with greater regularity in raising the fed funds rate. If correct, we expected that would surprise many investors. In fact, many investors did react with surprise to the more hawkish statements by the F.O.M.C.. following its September meeting as well as chair Yellen’s press conference statements. One reason for our more aggressive view came from the past minutes of the F.O.M.C.. those minutes showed their concerns that the strength of the labor market would overshoot expectations and lead to “undesirable outcomes.” On the other hand, in our view, we did not expect the F.O.M.C.. would focus on low inflation as a reason to hold off raising the fed funds rate. Very simply, while economists may express their concerns about the impact of low inflation, consumers welcome it. Those who lived through periods of double digit inflation in the seventies and early eighties wonder why low inflation causes any concern. More important, the combination of a strong labor market and low inflation gives the F.O.M.C.. the political cover to move the fed funds rate higher with regularity. The ultimate goal will be to reach a fed funds rate of nearly 3% by 2020. One reason the F.O.M.C.. may place less emphasis on low inflation in formulating monetary policy comes from the fact that they do not fully understand the forces influencing low inflation. A recent graph attached to chair Yellen’s Cleveland speech breaks down the causes of low inflation into four factors. Interestingly, for 2017, the undefined “other” provides the dominating factor “explaining” low inflation. 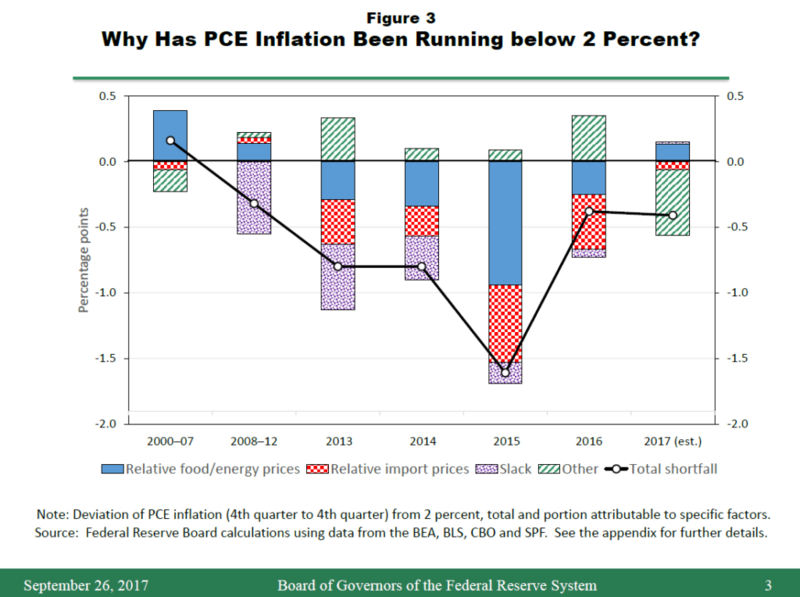 The fed describes its understanding of the forces driving inflation as “imperfect.” Chair Yellen called low inflation a “mystery.” The mystery may be why, despite aggressively using quantitative easing (q.e.) over the last decade, both economic growth and inflation remain below historic norms. A non-consensus view suggests that the money created by q.e. did not flow into the economy. Instead, they argue that the growth of the excess monetary base went into excess reserves at the banks. The banks then held their excess reserves at the fed and did not lend them out. Despite this mystery or because of it, low rates of inflation, in our view, will not impede the F.O.M.C..’s regular pace of rate increases. The ulitmate goal of this steady process would be a return to a more “normalized” monetary policy. The unusual length of the economic recovery, in our view, creates an unsaid motivator further driving the F.O.M.C.. to regular but modest rate increases. This worry showed up in a recent comment by chair Yellen at her September press conference when she said, “so at the moment, the funds rate is very low. It is below that normal level. So at the moment, i would say the zero lower bounds is a concern, and we have less scope than i would like to see or expect us to have in the longer run.” While the F.O.M.C.. cites various data to support changes in the fed funds rate, this comment, in our view, reflects the unsaid driver for regular fed funds rate increases. That goal would be to put sufficient tools in place to deal with an economic slowdown some time in the future. As chair Yellen expressed it in her September press conference, “monetary policy operates with long and variable lags.” With that thinking, the F.O.M.C. sees the need to start now to be position in 18 months and beyond for the first signs of either higher inflation or economic slowing or both. As she stated in her September press conference, “I am not in favor of ‘whites of their eyes’ sort of approach.” In her recent Cleveland speech, she at first said “gradual pace of adjustments” but later stated “but we should be wary of moving too gradually.” Therefore, the word “regular” rather than “gradual” better reflects F.O.M.C. policy for raising the fed funds rate. In the short-run, despite its recent steps, the fed sees its current position of monetary policy as “modestly accommodative.” At the same time, the overall economy shows no signs of slowing as it moves through the maturing of the economic cycle. Certainly, investors remain comfortable with the outlook for the economy and earnings. For the first time since 2005, there have been no market moves this year greater than 2%. We remain cautiously optimistic. With our expectations, for regular increases in the fed funds rate and the likelihood of higher long rates, equities will be dependent on earnings per share growth rather than price/earnings multiple increases. In comparison, over the recent decade multiple increases played the key role in the price performance of equities. In our view, over the next 18 months, as quantitative tightening begins to take hold, investors should begin to consider alternative products as one form of diversification. Alternatives can help moderate the potential for higher volatility if interest rates rise. Disclosures: Past performance may not be indicative of future results. There is no assurance any of the trends mentioned will continue or any forecasts will occur. First Capital Advisors Group, LLC is a federally registered investment adviser under the investment advisers act of 1940. Registration as an investment adviser does not imply a certain level of skill or training. The oral and written communications of an adviser provide you with information about which you determine to hire or retain an adviser. First Capital Advisors Group, LLC, form adv part 2a & 2b can be obtained by written request directly to: First Capital Advisors Group LLC, 200 white road, suite 215, little silver, NJ 07739. The information herein was obtained from various sources. First Capital Advisors Group, LLC does not guarantee the accuracy or completeness of such information provided by third parties. The information in this report is given as of the date indicated and believed to be reliable. First Capital Advisors Group, LLC assumes no obligation to update this information, or to advise on further developments relating to it. This is prepared for informational purposes only. It does not address specific investment objectives, or the financial situation and the particular needs of any person who may receive this report.